Charles Dickens. Stampin' Up! has collected several beautiful sayings in a stamp set called From My Heart (Annual Catalog, p. 99). This month, instead of the normal Valentine's colors of pink and red, we will step outside of the box and use orange and blue (Tangerine Tango and Tempting Turquoise). The card will be featuring Mr. Dickens' quote complemented by the Gorgeous Grunge stamp set (p. 109). The splatters of blue give the card an eclectic feel, or shabby chic as they say. I bought the White Tea Lace Paper Doilies (item #129399) several months ago, but hadn't quite found the right card for it. I think the paper doilies can really make a shabby chic card! 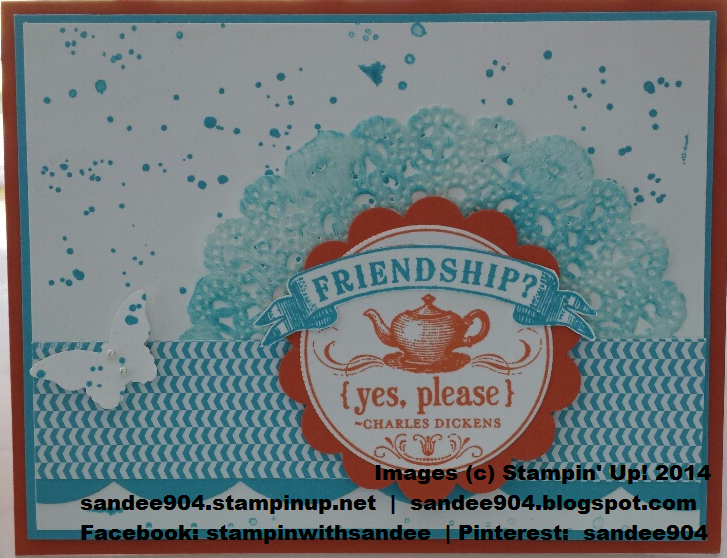 I wasn't happy with plain white so I sponged with Tempting Turquoise ink and I think it truly makes the card pop now. If you need dimensions or detailed instructions, please send me an email and I'll email a pdf to you. Don't forget that Sale-A-Bration runs through March 31. This is a great time to hold a party or make an individual purchase since for every $50 you spend, you can select a FREE item from the brochure that is not yet available in current catalogs or online. If your party sales reach $300 or more, in addition to the $50 in hostess dollars, you will receive an additional $30 in hostess dollars. That is $80 in FREE product! Click the link to the right to view the brochure. 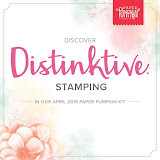 If you join my Stampin' Up! 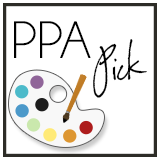 team for $99 during Sale-A-Bration (thru March 31, 2014), YOU will select $150 worth of product for your starter kit, and can start earning your product, learning some great craft ideas, and meeting some great people that turn into great FRIENDS!